Stitched on Silkweaver 32ct Purely Primitive with Carrie's Threads Deep Purple. I just love Purely Primitive! Why did I not discover it sooner? Oh, and if you take a closer look you’ll notice that I omitted the three rows of specialty stitches that were supposed to be where the partially-stitched straight line is. I’m a wuss, I know, but I did try several times to get the rice stitch right and the thread just kept knotting so I gave up and decided to keep things simple. Because of Present, I was naughty and didn’t work on Still Waters on Friday/Saturday as I was supposed to. Sorry, Melissa! The whole package. Love everything! I’ve been at home on medical leave these past two days so this really cheered me up. Thanks, Caroline! Okay, I’m off to get Alison from the school bus now, so write soon! Progress on a couple of fronts. I finished the third square on Summer Snapperland last week. I’m getting so close to finishing this! Just one more square and the border and I’m done! I can smell the finish line from here. Here’s what my Snapperland looks like now, pardon the rumples. I wish there were more crabs in this design. On Friday (well actually, Saturday), I worked on Still Waters for my SAL with Melissa. I like how it’s coming along and am hoping I’ll get to finish the central motif as well as the sheep and lion this week. I’m not too sure I like the llama’s face, though. Still trying to get the fabric colour right in photos. I decided to stop being a slob and tidy up the mess that is my crafting space. I’m fast running out of room to keep everything, so it was about time I sorted stuff out. 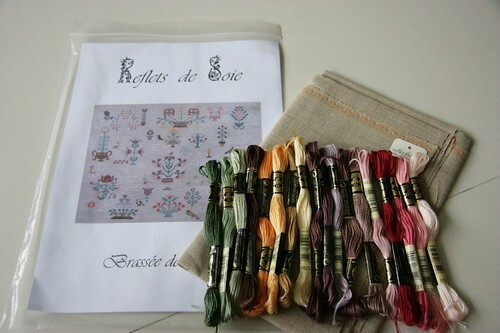 In the process, I discovered Reflets de Soie’s Brassee des Fleurs, which I had kitted out with floss a couple of years ago but never got around to starting. Since I do love the design and want to get it done, I dug through my stash box and realised that the flax linen which I had originally set aside for it had been used for something else. So I tossed the floss with natural linen and took a picture to get some opinions. What do you think? Should I go with natural or flax linen? The flax would show off the colours beautifully, but that would mean having to buy a half of it for this design. The natural is the perfect size but I’m concerned it’s a bit too dark. Opinions, please! Well, last week was a crazy week in the Wee household. DH came down with what was first suspected as a bacterial infection, which was subsequently rediagnosed as viral fever, which was subbsequently termed “mild dengue fever”. He’s on the mend, but it’ll be some time yet before he’s back to his normal active self. I like the peacock! He's missing his neck, though. I also put a few more words into To Laugh Often. I’d not picked it up since January so it was high time to get it out again. DH asked me when I was planning to give this to my Dad, and I said November this year for his birthday. 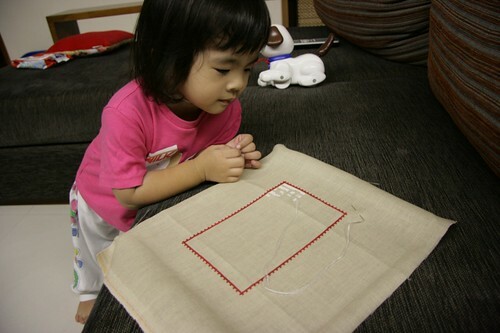 ‘Course, he was supposed to have received it LAST year for his birthday, but I’m not called The Slow Stitcher for nothing! I made some headway last night while watching Prison Break Season 4. Some stash arrived, which made me happy. I think I will stop now, since my stash boxes are overflowing and I think I’ve achieved S.A.B.L.E. More goodies from Drema at Needlecraft Corner. 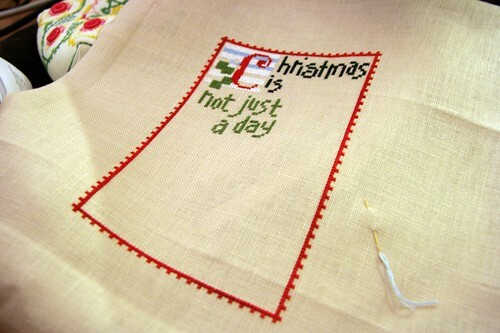 Lovely fabrics from Lakeside Linens, Picture this Plus and Countrystitch! That’s all, folks! Be stitchy! Still Waters first WIP pic. Still Waters. 32ct Countrystitch Cappuccino linen with DMC. Here’s where I stopped on Still Waters. I am loving the fabric I chose – at first I thought I would use a piece of Lakeside Linens’ Peddler’s Moon, but then I realised that it was too close to some of the floss colours. After rummaging through my fabric box (during which I discovered that a giant piece of white Belfast had fungus growing on it, followed subsequently by the equally shocking discovery that one of my beloved Botkier bags has also become a mould farm – ACK!) I found a fat quarter of Cappuccino which I had ordered sight unseen from Catherine at Countrystitch last month. It’s a lot more cappuccino-ish than you see in the photo; maybe I’ll be able to capture the colour more accurately next time. In the meantime, if you have suggestions about what to do with fungusy linen, please share them with me. Anyway, Still Waters has been a pretty easy stitch so far. The star is not complete because I was too lazy to bobbin my floss and I didn’t get more of the border done because, honestly, I hate stitching borders. Boringggg. Melissa, I’m looking forward to seeing your WIP pic! Here’s how far I got with Christmas is Forever before I put it aside to start on Still Waters, which I’m SALing with Melissa late last night. DH has a friend visiting from Australia so I joined them for dinner last night and got home near midnight, which didn’t leave much time for Still Waters. I’m going to cheat a bit and play catch-up this weekend though. In the meantime, here’s Christmas is Forever. Taken at night, so the colour is not as accurate as the next picture. Taken this morning, but I was too lazy to adjust the levels much. Pardon the creases! 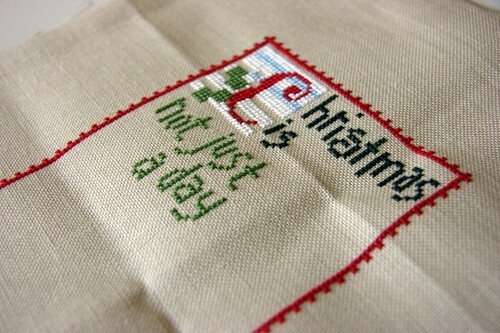 I have been browsing the Needlework Show but nothing screams “buy me!” so I don’t think I will be ordering anything. I do like some of the reproduction samplers, but not enough to get them. What are your favourites from the show? I have a few stashy photos to share, but this gorgeous biscornu that I received from Nita for the Tiny Treasures biscornu exchanges deserves pride of place in this entry. Behold the biggest biscornu I’ve ever seen. She's supposed to be in bed but who can ever tell a 2.5-year old what to do. And now, the moment you’ve all been waiting for, pictures of STASH. I’ve been a bit mad lately (when am I not, really), and have been sending Drema at Needlecraft Corner a few too many email orders. Here’s the latest batch. Free Bird and Quaker Seasons of Friendship. I know I said I'd never be able to finish stitching Quaker Seasons of Friendship, but one can always buy the chart in hope! CCN Beach Cottage and She Sells Seashells. And finally, threads. Can you make a guess as to what the Carrie's Creations threads are for? Take a wild one. The Silk 'n' Colors are just for fun - I haven't tried them before so decided to get a couple of skeins to see what they're like. Well, that’s all folks. I am hoping to get more stitches into Christmas is Forever tomorrow, because Friday Melissa and I start our Plum Street Samplers Still Waters SAL, which I’m excited about since I’ve loved that design for ages. I’m actually a little under the weather today, so I think I’ll go to bed early. 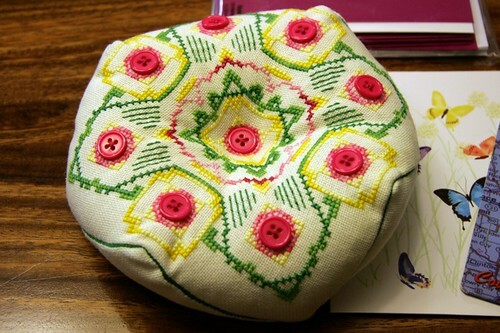 Till the next entry, which just might be about my spoils from the Needlework Show.